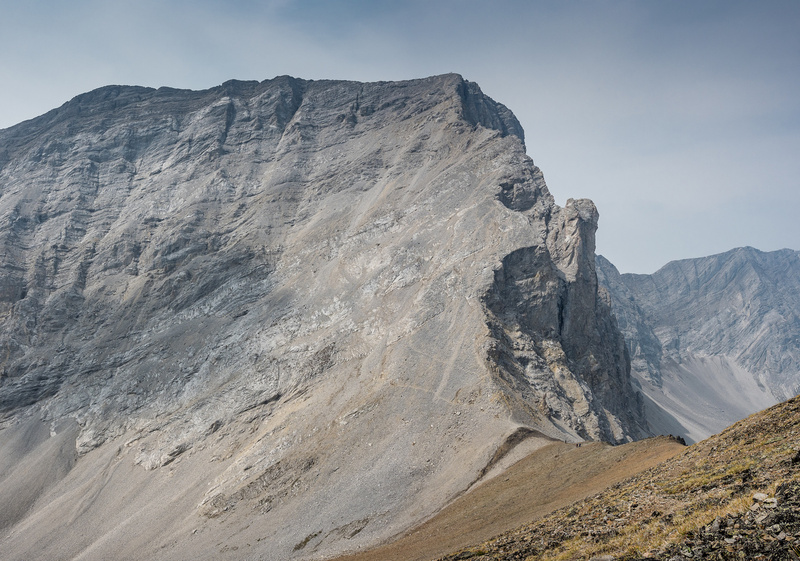 Difficulty Notes: Pretty easy hiking and scrambling to this minor summit at the Highwood Pass area of Kananaskis Country. After bailing on my original plans for the weekend thanks to an unstable weather forecast, I was sitting at home in front of my computer with a long face when my wife, Hanneke walked downstairs and said, “why don’t we go for a hike instead”? Indeed. 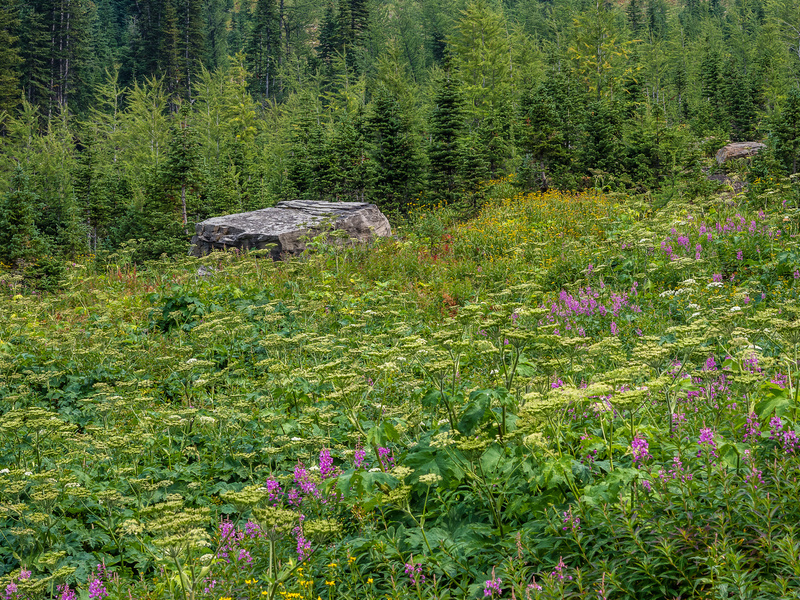 Why not go for a hike instead of moping around the house all day? 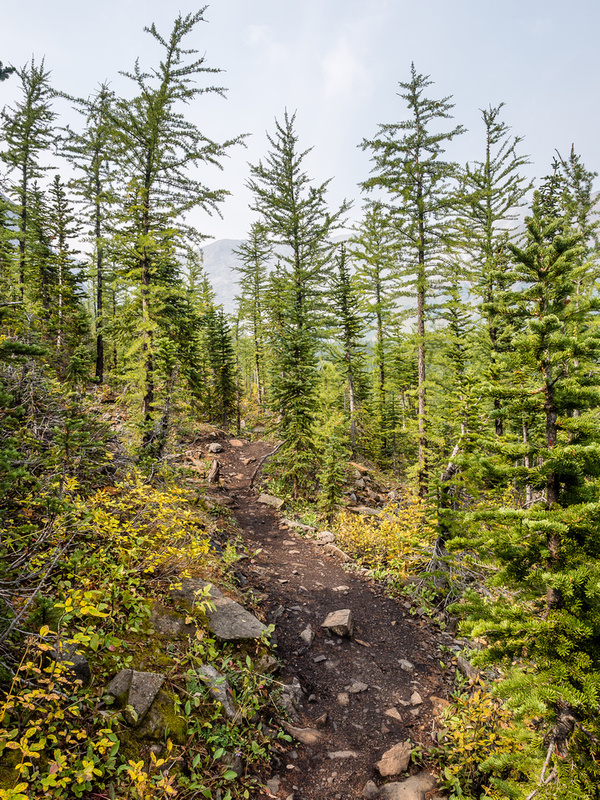 The weather for Saturday was actually looking pretty decent and despite lingering smoke from BC wildfires, a hike sounded perfect. 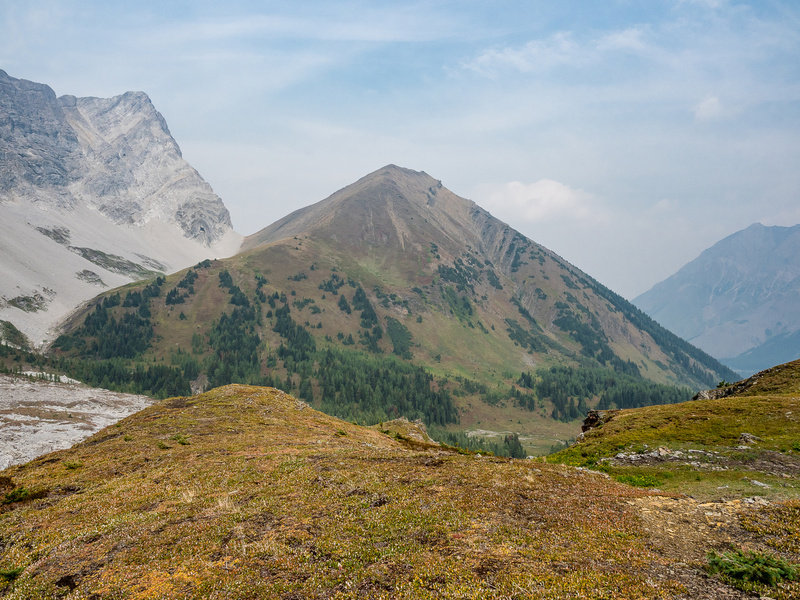 After some fast thinking (it was already around 09:00 at this point – I’d already done an 8km walk that morning too), we settled on Grizzly Ridge in the Highwood Pass area of Kananaskis as our hiking destination for the day. I thought that Grizzly Ridge was more of a hike than a scramble – I expected it to be similar to Pocaterra Ridge, if not easier, and Hann had hiked that with me in 2011 no problem so I figured this was the perfect choice for a short, last minute hike that would still burn some calories and give some exercise. 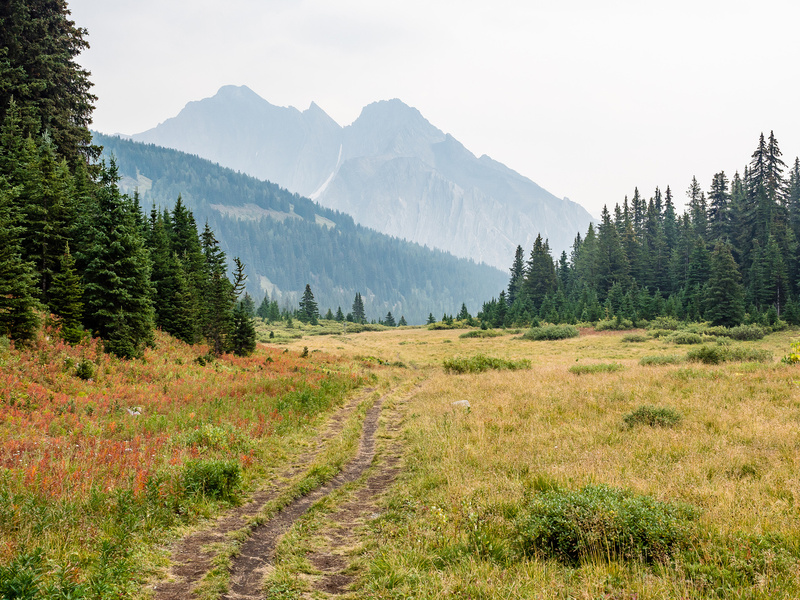 We drove up to the very busy Highwood Pass parking lot and proceeded up the trail that leads into the cirque beneath Mount Tyrwhitt and Pocaterra. At this time of the day there were tons of people on the route, but I found out a day later that a friend was turned around on route to Pocaterra Ridge by a Grizzly earlier in the day! This is quite funny because there must have been at least 20-30 people on Pocaterra Ridge when we looked at it from our hike. 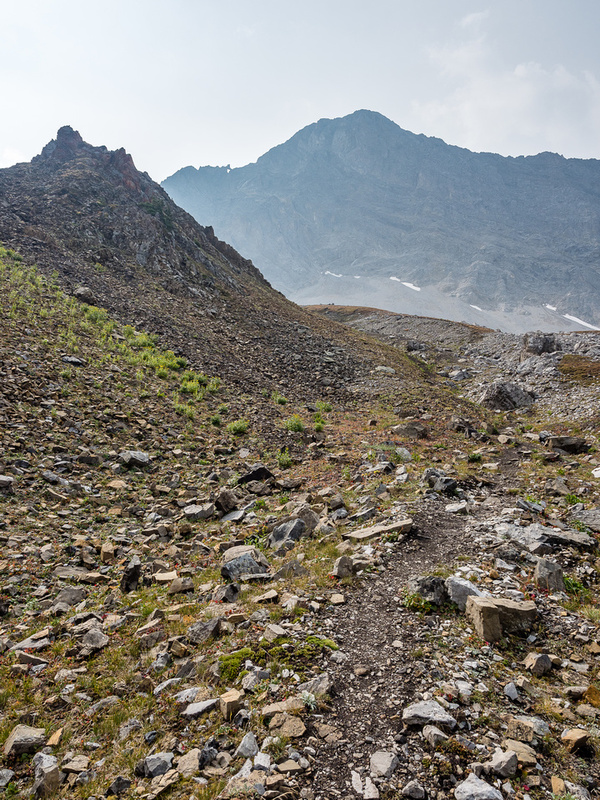 The trail leading into the cirque has gotten even more confusing than last time we hiked it, back in 2011. 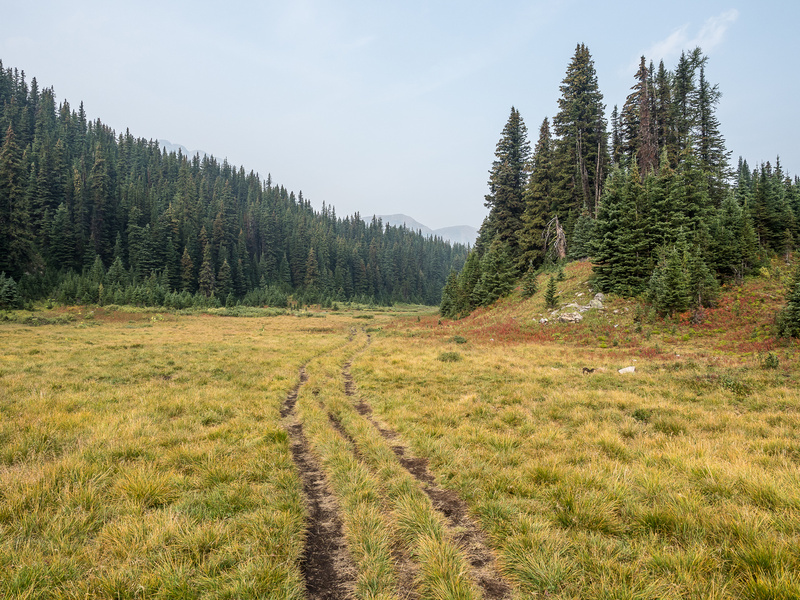 There are numerous side trails and “shortcuts” and muddy tracks, especially once you take the 90 degree left turn towards the cirque. I think some signage would not be out of place here. Originally I wasn’t even going to carry my camera due to the smoke, but I’m glad I changed my mind because although it was smokey, there were some nice views as we worked our way down into the cirque and from there to the branch leading left to the Grizzly / Tyrwhitt col and right to Pocaterra Ridge and Mountain. 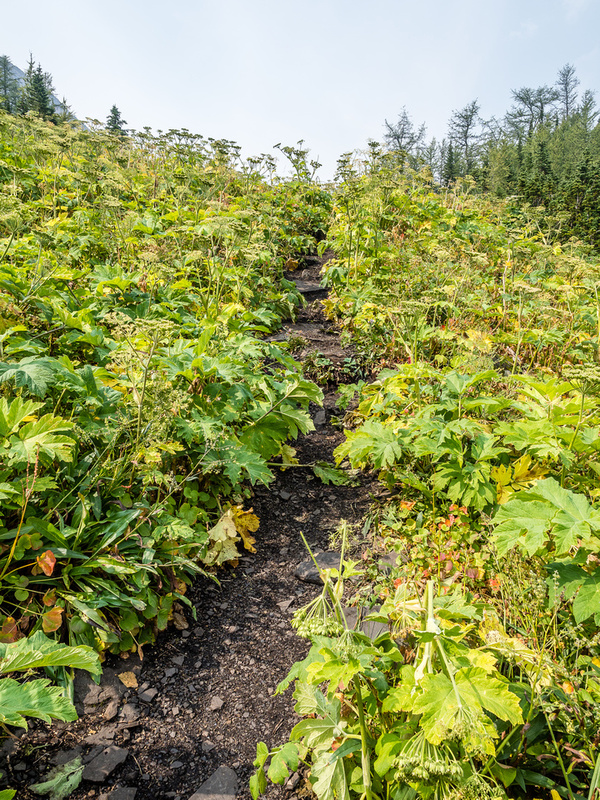 As we worked our way steeply up to the Grizzly Col, I realized once again that hikers have a much different view of “easy terrain” than scramblers / climbers do. Although she was doing just fine (we were setting a fast pace IMHO), Hann wasn’t entirely happy with the loose scree and limited exposure as we gained the col. I was surprised when she said she “might not make the end”, but she was game to go to the ridge crest above, so we kept going up from the col in a cool wind. The view back to Mount Tyrwhitt made that moderate scramble look insanely steep. 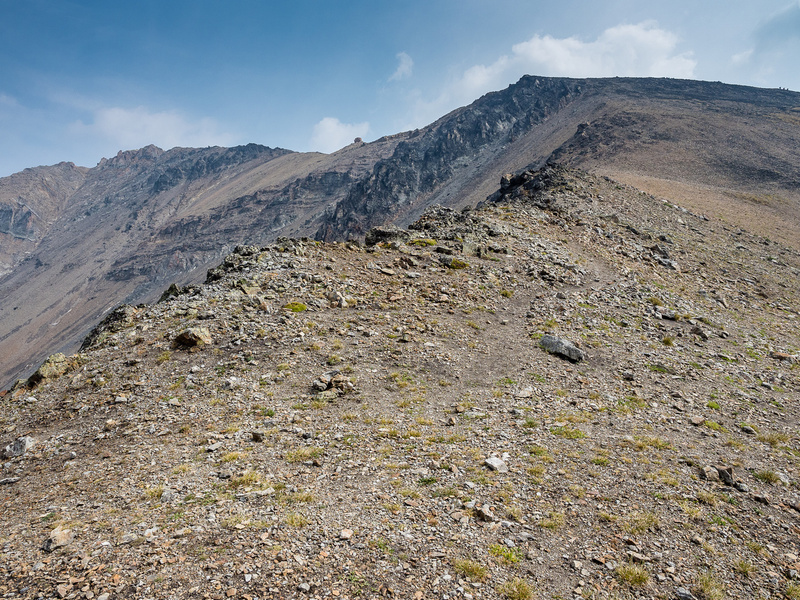 I knew it wasn’t, but was still surprised by the amount of people scrambling up this loose pile of Rockies scree! I was glad most people were wearing helmets because there was a LOT of rockfall coming down that route! I was also surprised (but not really) but the number of people I’d spotted on top of the infamous “window” on the ascent ridge as we hiked up to the col from below. Apparently that particular IG shot has made this place quite popular over the past few years. From this angle the east face of Mount Tyrwhitt looks insanely steep but it’s not. There was copious amounts of rockfall coming down it from scramblers though! We kept ascending to the ridge but once we made the crest, Hann decided she’d had enough and agreed to wait for me to tag the summit, which was still about 1/2km to the north along a nice looking ridge. 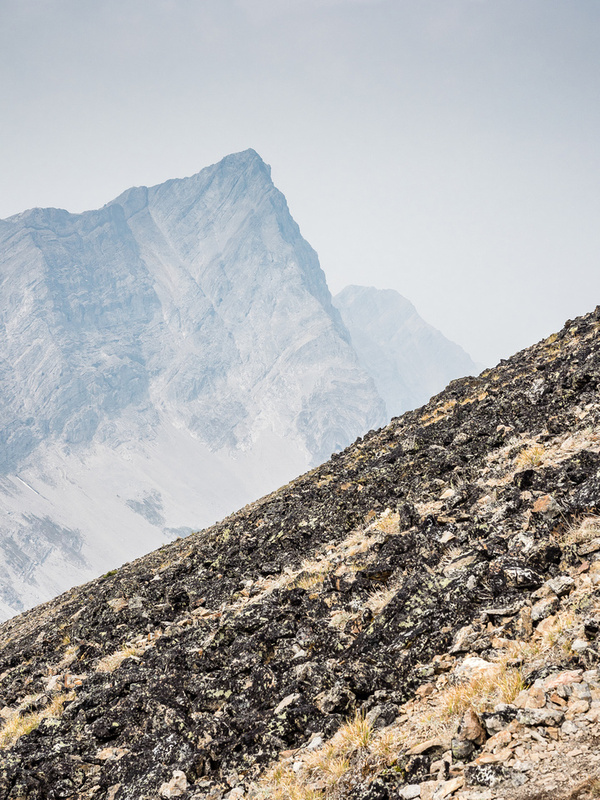 I made quick time on the fun (easy) ridge and was soon at the apex where two guys were relaxing and taking in the surrounding views – limited as they were in the smoke. I was surprised how much higher Grizzly Ridge is than Highwood Ridge, I thought they were closer in height for some reason. 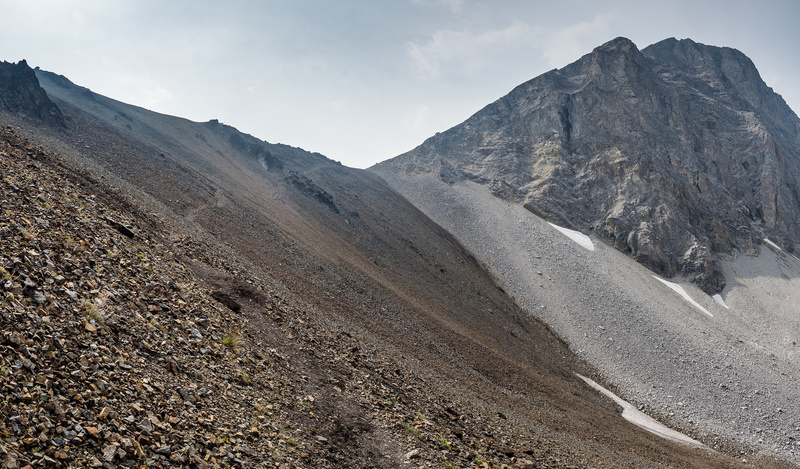 I chatted briefly with the two gentlemen before descending back to Hann and then back to the col and down the scree trail into the cirque where we had our lunch. 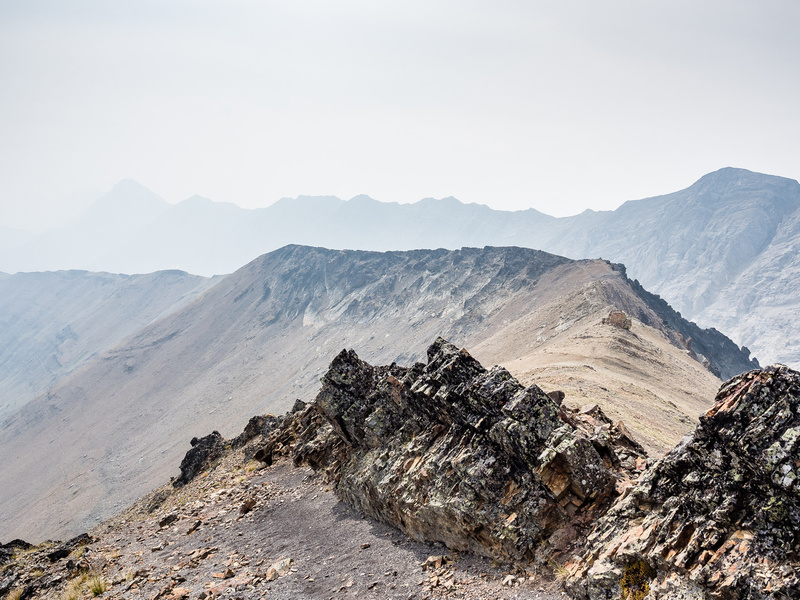 Grizzly Ridge is quite scenic – this is the view from where we tagged the crest, looking towards the summit. 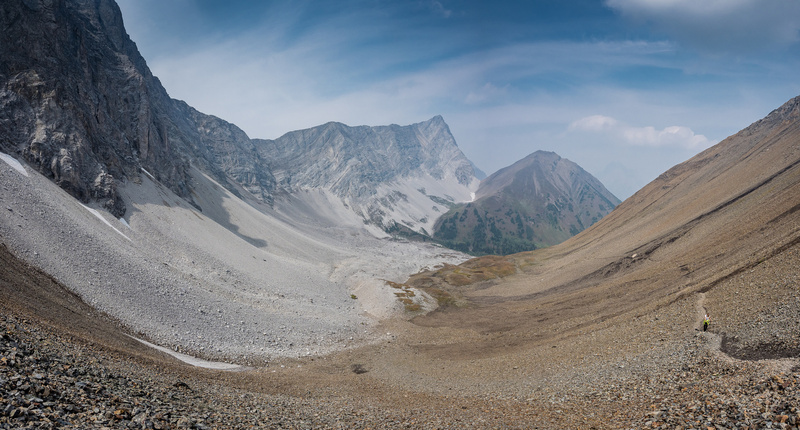 Views from just below the summit included (L to R), Tyrwhitt, Pocaterra, Pocaterra Ridge, Mount Rae, Arethusa and Highwood Ridge. 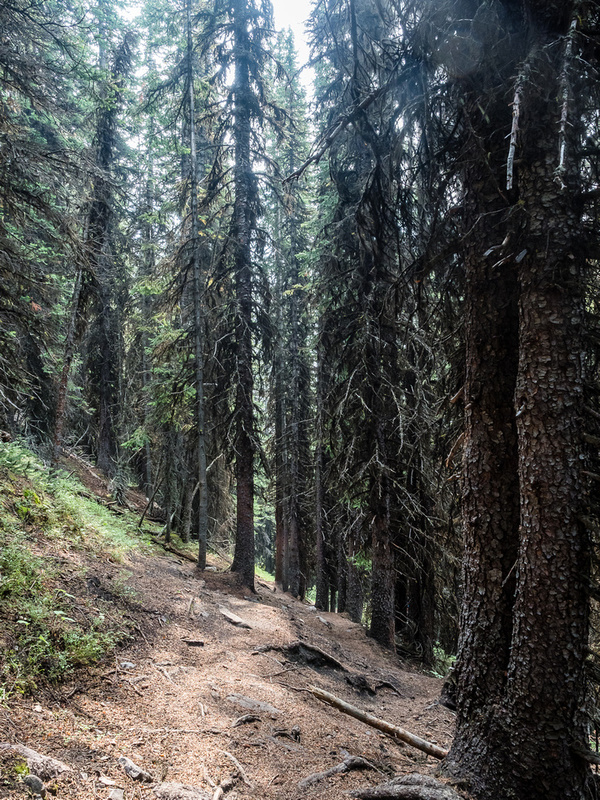 The return to the parking lot was fairly quick but once again I was surprised by the sheer number of confusing trails around the north end of Highwood Ridge. 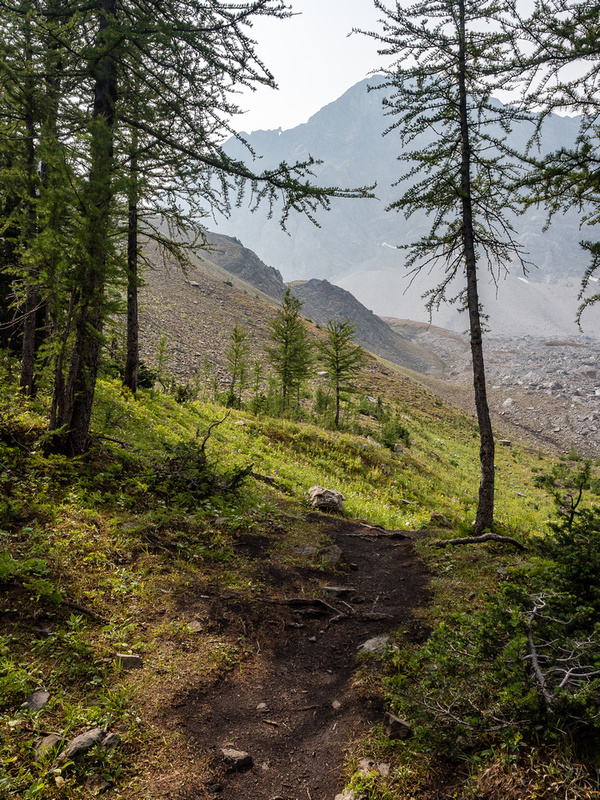 I enjoyed this short, easy hike / scramble but would recommend doing it a bit later in the year when the larches are out in the Pocaterra Cirque and the skies are clear of BC’s forest fire pollution. 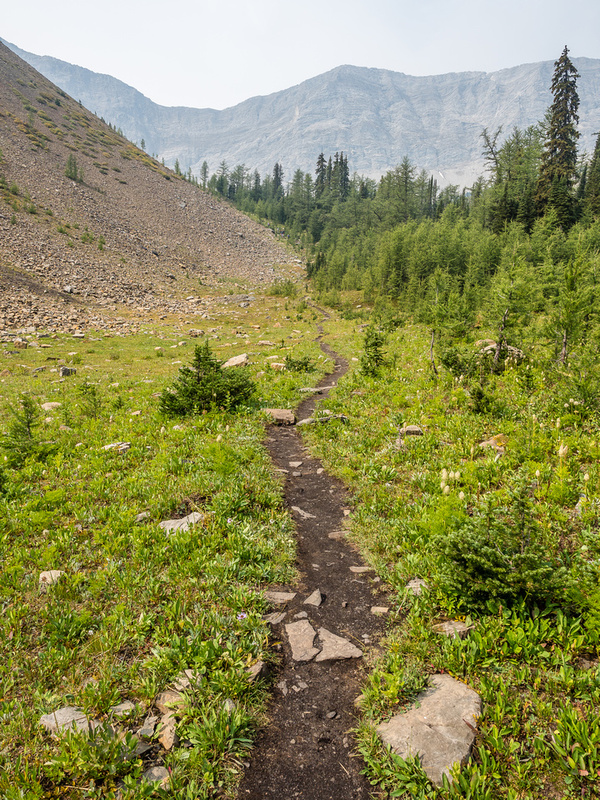 The trail into the cirque branches left off a gravel path that leads up to the Arethusa Cirque across hwy 40. 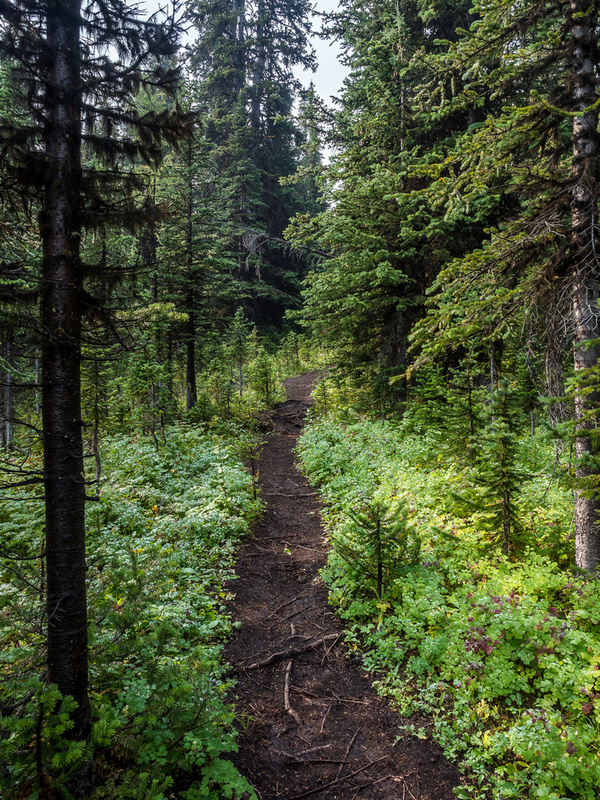 Initially the trail is obvious and there is only one. As we exit the trees and cross the first open avy slope, Pocaterra Cirque is visible in the distance at center. The larches aren't quite turning yet, but the smell of Fall is in the air. I'm glad I brought my camera - the scenery is still pretty nice even with all the smoke. The trail is obvious - there is a group of 5 ahead of us here. Pocaterra Ridge and Mountain come into view as we enter the cirque. 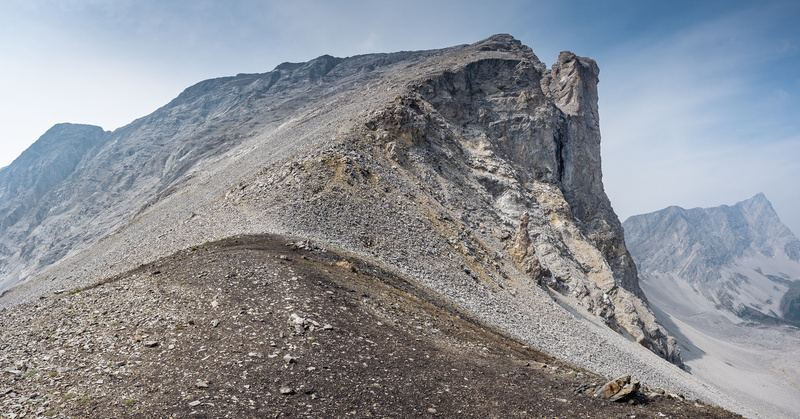 Once the trail breaks into the cirque it is quite lovely. 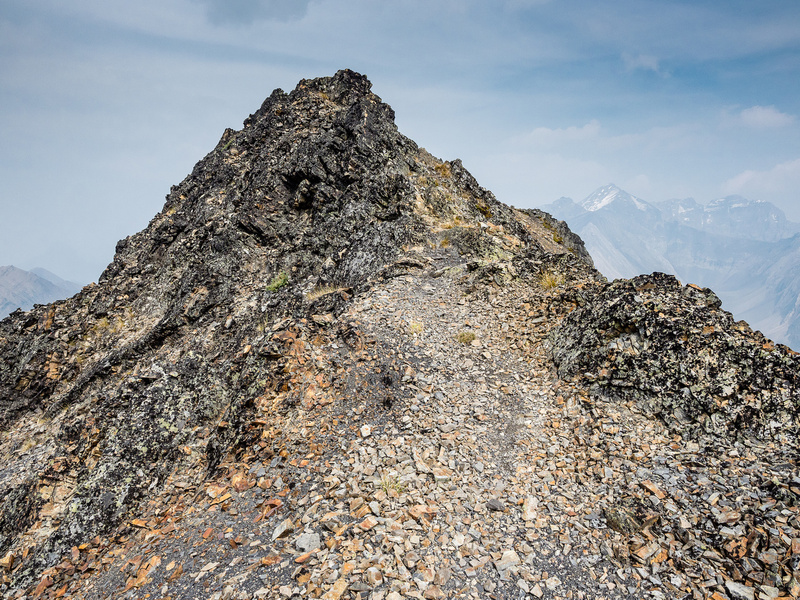 There is a beaten path in the scree that makes the route obvious but does require hiking footwear or you might be slipping around quite a bit. Spot the figure on top of the window. 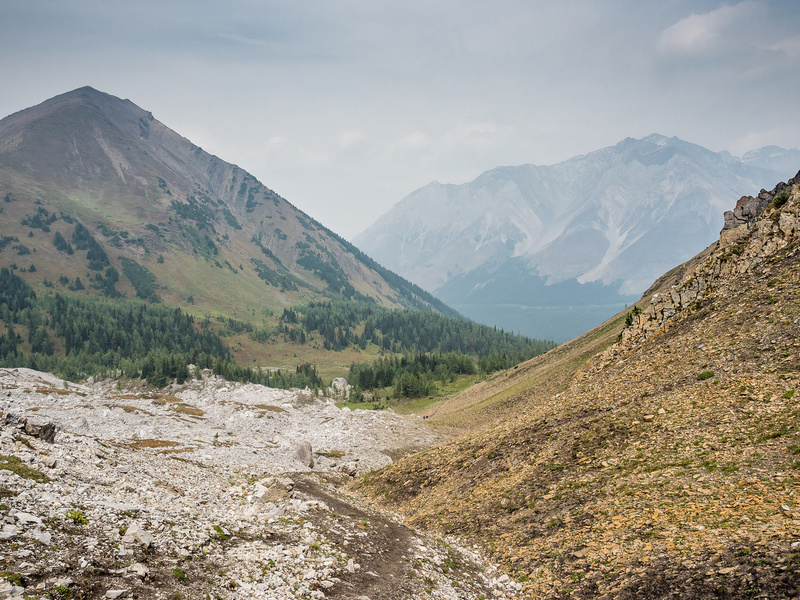 Looking up towards Grizzly Ridge (L) and Mount Tyrwhitt (R) as we start the scree grind to the col which is obvious at right of center. Nice views back towards Pocaterra Ridge. 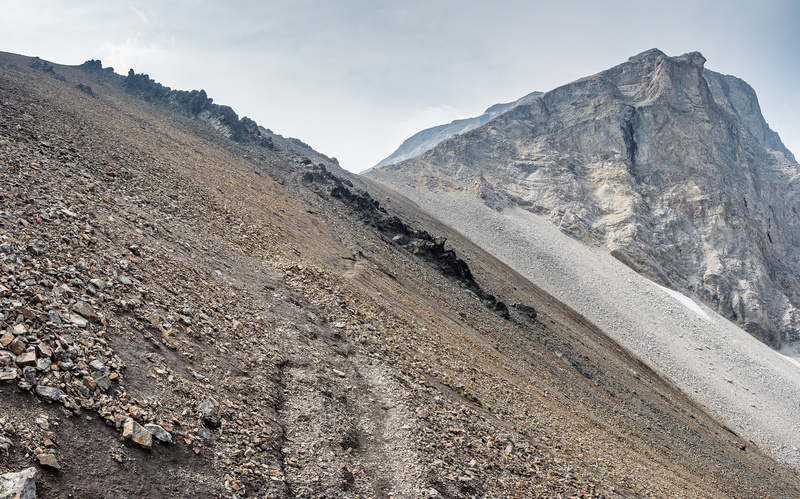 Looking up the beaten trail in the scree towards the col with Tyrwhitt looming above. The angle to the summit of Tyrwhitt doesn't look so bad from this side. 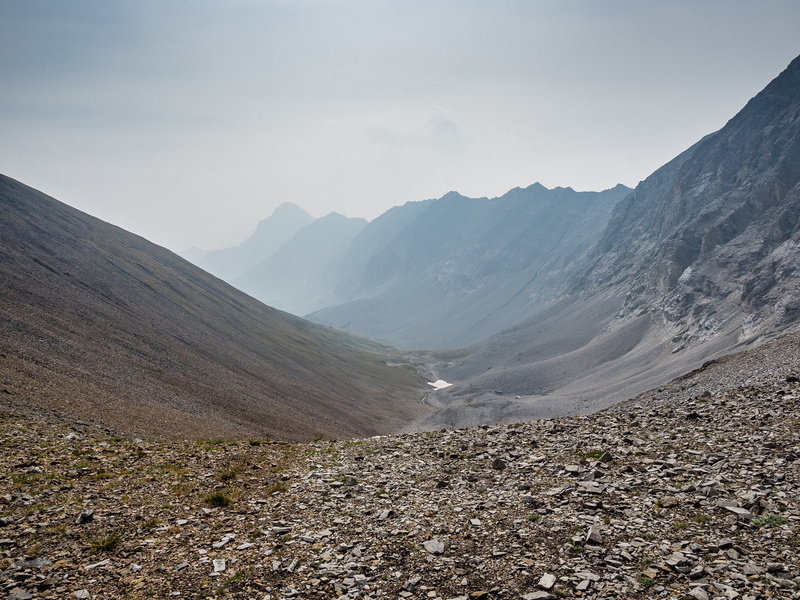 Looking back along the scree trail towards Pocaterra Mountain and Ridge. Approaching the col there is some easy scrambling through the rocks ahead. This is where I realized that hikers don't always appreciate scrambles. Very interesting views from the col up Mount Tyrwhitt almost made me want to dash up it - if it weren't for hordes of people knocking rocks down this slope I likely would have. 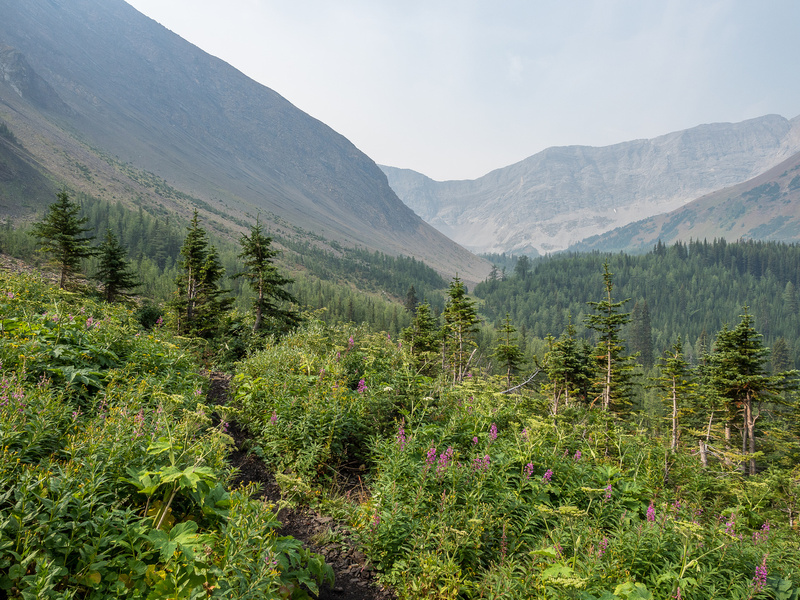 Views south of the col were somewhat limited thanks to BC's wildfire pollution that's been plaguing the Rockies most of August 2018. Looking up the easy west slopes of Grizzly Ridge. The summit is at upper left. From this angle the east face of Mount Tyrwhitt looks insanely steep but it's not. There was copious amounts of rockfall coming down it from scramblers though! 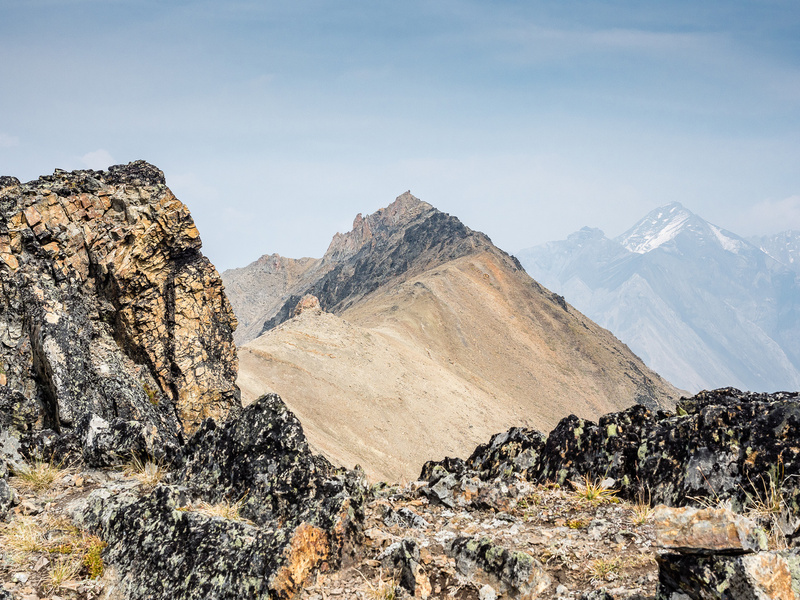 Grizzly Ridge is quite scenic - this is the view from where we tagged the crest, looking towards the summit. The ridge is mostly pleasant hiking with some very easy scrambling. 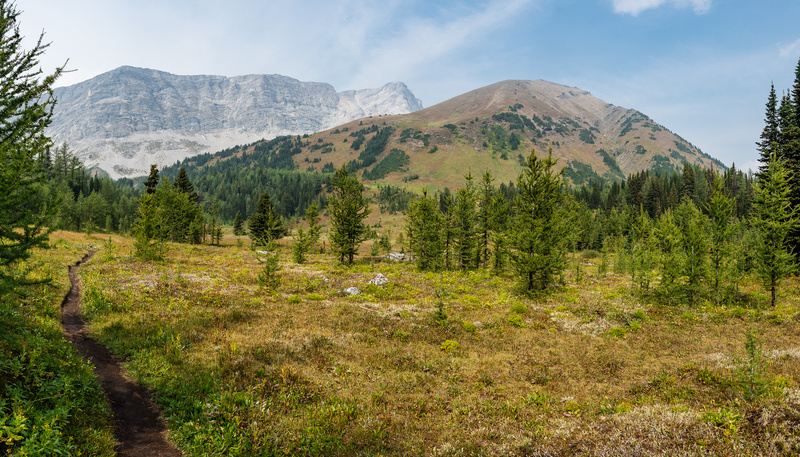 Highwood Ridge is at center with Rae, Arethusa and Storm mountains visible in the distance. A moonscape atmosphere as I look back along the ridge. 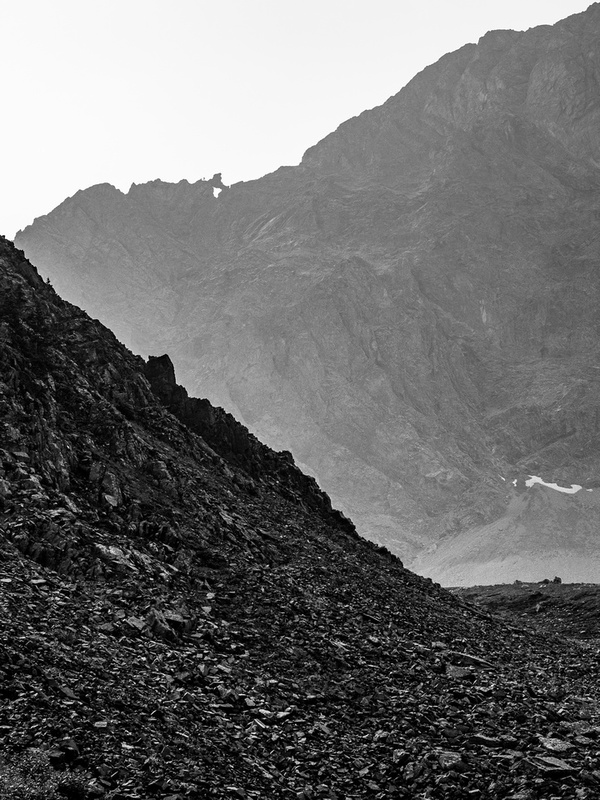 Some very easy scrambling on the ridge - but hikers won't always appreciate these sections. Nearing the summit with some more easy scrambling sections. 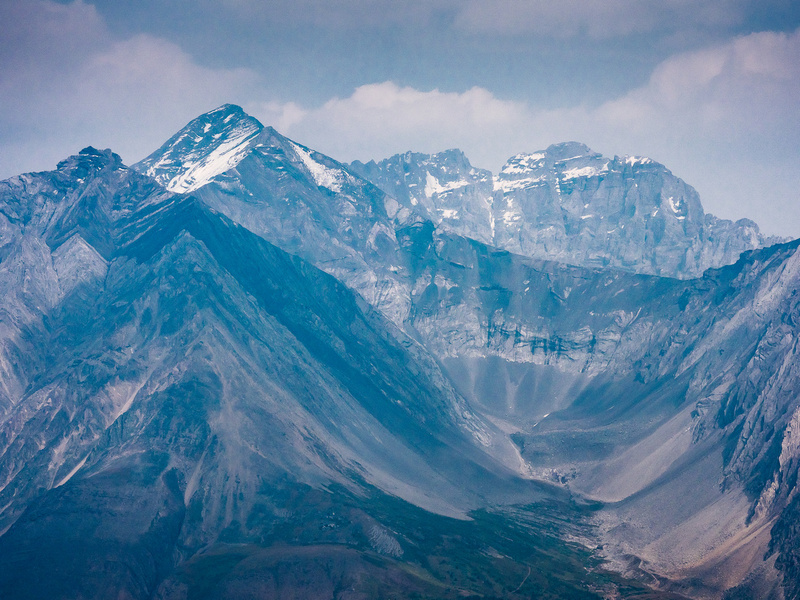 From L to R is Tyrwhitt, Pocaterra and Pocaterra Ridge. Mount Rae - at over 10,500 feet high - received some snow the night before, but it was quickly melting off. 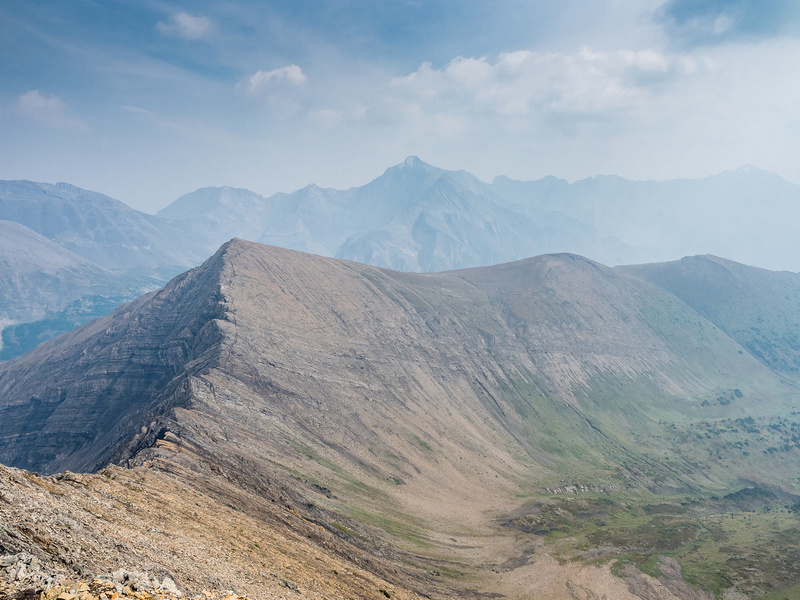 Looking over the route to Highwood Ridge towards Storm Mountain. Interesting "moonscape" views off the ridge towards a distant Mount Pocaterra. Descending back into the cirque. Still lots of flowers out - but they're fading quickly. There's fall in the air as we head back to the parking lot with Storm Mountain looming above in the distance.